Confound tenacious squirrels before they raid your bird feeders using the Woodlink Post Mount Squirrel Baffle. This baffle creates a protective barrier around your 4 x 4 post, by preventing squirrels from climbing up the post and pilfering your bird seed. The sturdy 22" diameter unit can double as a predator guard, keeping some raccoons and other predators from entering a bird house. To use, simply wrap the baffle around your existing 4 x 4 post, and secure it with wood screws through the welded brackets. This baffle is most effective when placed approximately 4' to 5' above the ground. 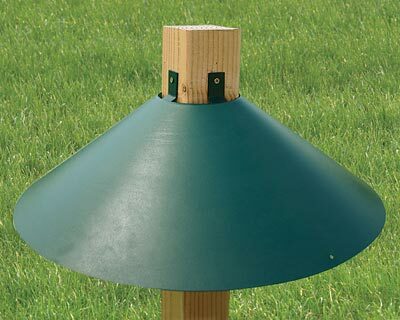 For long-lasting durability and beauty, this baffle is powder-coated in an attractive, dark green color. The weather-resistant finish withstands years of protection and use. Keep squirrels and other animals away from your bird feeders and houses using this Post Mount Squirrel Baffle.